"Gerry, it's time" shrieked Allison. Gerald was going over some notes on his latest project in preparation for the presentation on Monday. "What's that you said, dear?" "Oh...OH, it's THAT time. These were the words he had both been looking forward to and dreading for the last nine months. He had mentally rehearsed each moment and memorized every turn to the hospital, including several alternate routes in case of traffic. "Think" he mumbled to himself. "Grab the car, put Allison in the bag...hospital, I gotta call the hospital. No, bring the car around and wait, I'll get it...just calm down...and breathe." "Gerry, I'm the one whose supposed to breathe. You call the hospital and tell them we're coming, take the bag to the car and bring it around to the front. We'll call Mom on the way." "Sheesh, there's no one more nervous than a new father-to-be" declared Allison. "It will be all right." Gerald brings the car up the front drive and helps Allison into the passenger's seat. "Let me slide the seat back for you." "Thank God this is it" she exclaimed. Allison's size had been an extreme source of frustration from being unable to tie her shoes to the shapeless dresses she'd had to wear for the last three months. While she embraced the thought of motherhood, she was a fashionable gal, and did not enjoy feeling frumpy. Even Gerald's constant reassurance that she was indeed the most beautiful woman on earth did not help when every time she walked past a mirror she saw a blimp in maternity clothes. They reached the hospital without incident, and Gerald promptly announced "I need a doctor...We're having a baby." "Relax" replied the nurse, calling for an orderly. "We'll take good care of your wife. If you would just step over here and fill out these papers. We'll take you to her as soon as she is situated in her room." "My first what? Wife? Yes, we were married last year. No, you mean baby. Yes, it's my first, how can you tell?" "Well, under reason for hospitalization, you put "we're having a baby." "She's beautiful," cooed a jubilant Gerald. "She looks just like my mother when she was a baby. I have her old photo album, and there is a picture of her in my grandmother's arms. She had beautiful blond curls, too. I'll have to show it to you sometime. Oh, I've been going on and on, and I bet you just want to sleep. I'll get the nurse to take the baby back to the nursery, and go make those phone calls. Wait, I've got to get a picture to send everyone, I know I'll just email them instead of calling. "Gerry, I love you, but just go...please. It's been a really long day-all 24 hours of it. I'll see you tomorrow. Back at home, Gerald revels in his new fatherhood status, and prepares to send a picture of who? She doesn't even have a name yet. He regroups and sends a picture of his lovely new daughter...name TBA. When Gerald arrived back at the hospital the next morning, he was so excited. He knew what he wanted to call their daughter. Upon entering Allison's room he blurted out "Her name is Abigail Christine! For our mothers, that is if you like it." "Good morning to you, too, Gerry. Of course I like it. It's perfect! I just wish I could have met your mother." 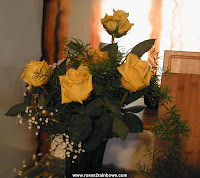 She smiled a sad smile, remembering the yellow roses. "We shall call her Abbey, and paint her room yellow - no pink for my daughter." Gerald laughed at the thought. For all her femininity, Allison hated pink, especially that pale, baby girl pink so many mothers dressed their little girls in. Not for Abbey! "The doctor said you can go home this afternoon, and everything is all ready so all you have to do is rest. Janet even brought over a casserole and chocolate cake for our dinner." "She's a sweetheart" replied Allison, "and such a good cook. Oh, is my mother coming over?" "Of course she is" said Gerald with a smile. He truly liked his mother-in-law and welcomed her help. He knew that most new mothers wanted their mothers nearby. Since babies don't come with instructions, their experience is appreciated. Once they got Allison and Abbey settled into the master bedroom where the crib had been set up, Gerald set about heating the casserole and setting the table. He knew Allison wouldn't feel like sitting up too long, so everything was in place before he brought her to the table. "Put me down, please" she complained. "Thank you for caring, but I can walk. 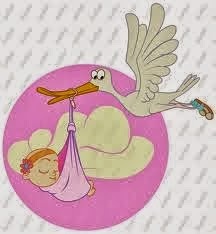 I just had a baby, not a broken leg." Abbey was in a baby seat on the chair facing Allison. Christine, Allison's mother, sat cooing at the baby, "you are such a beautiful baby. I love that little yellow outfit. It's perfect for you." As they sat enjoying their dinner, they heard an odd sound coming from the side porch next to the kitchen. Gerald went to investigate, but saw nothing and returned to the table. There it was again. It sounded like someone walking in the kitchen. Again Gerald left the table. What he saw when he walked into the kitchen filled him with great joy, and at the same time left him feeling most uneasy. There in her apron with her white hair neatly coiled atop her head stood his mother. 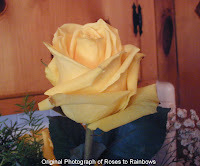 Well, not exactly in the flesh, but nevertheless, it was her, and in her hand was a bouquet of exquisite yellow roses. "Hello Gerald" she whispered. "These are for Allison. I am so proud of you and your lovely family. I loved her from the first time I saw her in the garden." "Oh Mother, I knew you were here. That I wasn't crazy or imagining things. It is wonderful to see you now. I have so many questions...like how...?" "Would it be too much for an old woman to ask to see her grandchild?" interrupted Abigail. Gerald was stunned, totally at a loss for words. What would they think? How could he possibly explain this? "Gerry, who are you talking to", called Allison. "Was someone at the door?" "Be right there dear" he called back. He was so used to talking to his mother in the garden he forgot to keep his voice down. "Now what do I do" he whispered? "Let me handle this. After all it is my afterlife, right?" answered his mother with a smile. With much trepidation, Gerald watched as his mother marched into the dining room to stand before Allison. "Hello, I am Abigail, Gerald's mother. I am so pleased to finally meet you." Without blinking, Allison extended her hand toward Abigail and said "I am equally pleased to finally meet you as well." Well, Gerald's jaw nearly dropped to the floor and Christine turned several shades of pale. Although she believed in life beyond death, she had never actually encountered it herself. "You mean you knew? How..."
"First of all you spend an awful lot of time in the garden talking to yourself when you think no one notices" explained Allison. "Then there was the appearance of the yellow rose on my plate after our first dinner together, and the brooch at our reception with no explanation for that either. It was just too much to be a coincidence." "At the hospital, when you told me what you wanted to name her, I almost said I wish I could meet your mother instead of I wish I could have met, your mother." "It helps, too, that I believe in the afterlife. You see I had a 'visit' from my grandmother when I was about ten. She had passed away a few years earlier." Allison turned to her mother-in-law, "would you like to meet your granddaughter?" "Say hello to Abigail Christine." For those of you who would like to catch up, here are the first 4 parts of the series. Six months earlier. "She said yes, Mother!" Gerald shouted, ecstatically. "Can you believe it? She actually said yes." Gerald knew his mother was lurking somewhere nearby. She usually did when he was alone in the garden. Allison sat cross-legged on the floor in the living room amidst a mountain of catalogs and brochures. Her blond hair hung in ringlets around her face as she bent over a cake catalog, murmuring "chocolate with vanilla icing, or butter cream with chocolate icing? No, I'd rather have carrot cake." Gerald had been watching from the next room, thinking she had never looked lovelier than she did now in her faded jeans and Bon Jovi T-shirt, representing Allison's favorite band. They went to see them the month before in Atlanta when they had picked up her wedding dress. She deemed "Thank You For Loving Me" as 'our song' and they danced in the aisle as the band played. Spotting him she smiled. "Gerry, have you talked to the photographer and videographer?" "I want to make sure they can be here for the rehearsal dinner, too. Did you mention that?" "Yes, dear, we are on their schedule for Friday night, and they will be at the church at noon on Saturday," replied her future husband patiently. "Everything is under control. You have gone over every detail to the utmost and then some." "Are you saying that I have obsessed over my perfect day?" "Not at all, sweetheart, not at all." "Well, I still have to choose the cake. What do you think? Chocolate or vanilla? Traditional or carrot cake? Maybe even carrot cake squares with little miniature candy carrots for decoration? I like it! It's settled." "I love a woman who's not afraid to make a decision" said Gerald, laughing. 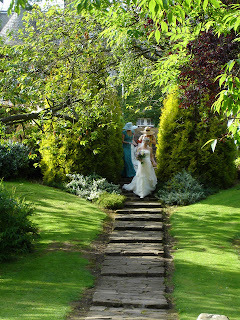 All brides have issues and obstacles to contend with to make it the perfect wedding, and there is seldom such a thing. The food is overcooked or undercooked, or someone has one too many cocktails and causes a scene or botches the toast to the bride and groom. And so after many months of planning, comparing prices, interviewing photographers, and sampling countless hors d'oeuvres, the big day finally arrives. As Gerald dons his rented tux, he fumbles with the tie. Frustrated, he mumbled "how does this go again?" Then he smiles, remembering their first lunch in the rose garden. It is so fitting that they exchange their vows in that same garden. That's why they planned a Spring wedding. The vestiges of Winter have faded away, but the wrath of Summer was not yet upon them and Mother's yellow roses were in full bloom just as he knew they would be. Allison emerges as the music begins. Dum dum de dum... Her bridesmaids lead the way, their matching pale blue dresses swaying as they walk. The bride was a vision of loveliness in her gown of satin and lace, strolling down the aisle as if on air. Her hands cradling a bouquet of beautiful yellow roses. She chose to wear her hair down covered with a lacy veil dotted with seed pearls. Allison's face was radiant as she turned to Gerald. He, himself, beaming to rival the sun. What a glorious day. Gerald wishes his mother could be there, and yet, at the same time he knows she is. After all it is her garden. The minister is speaking. "Do you, Gerald, take this woman...? Do you, Allison, take this man...?" They recite the vows they wrote together to each other. The minister pronounces them husband and wife..."you may kiss your bride" he said. "Ladies and gentlemen, may I introduce Mr. and Mrs. Gerald McLandon. Congratulations!" When they reached their table with their cake and champagne, Gerald notices a small box with a note at his place. He opened the box and his eyes widened with a mixture of disbelief and amazement. It was the diamond brooch that his father presented to his mother on their 25th anniversary. The note said "For Allison". Allison did, indeed, have the perfect wedding day. This is a continuation of the Rose Garden series. You can read parts one and two here: The Rose Garden and The Restoration. One night as Gerald sat on the porch watching the sun set over the garden, he paused to take note of how well the yellow roses were doing. He had taken quite well to the slower paced life here in Louisiana. He'd gotten on with a design firm in New Orleans and worked most days from his virtual office. On evenings like this he would sit and tell his mother all about his life and his latest project on the house. Of course, had anyone seen and heard the conversation, they would say "poor Gerald, talking to himself again." But tonight was special, and even though Gerald wasn't so sure people were wrong, he still spoke. "Mama, I've got great news. I've met someone. Her name is Allison. She's the most wonderful girl...and Gerald continued on, his words tumbling one over the other in his excitement, nearly forgetting he was alone on the porch. He concluded by saying "you will love her, I know you will!" As he got up to go in for the night he said, I'll bring her around soon. I can't wait for you to see her." Indeed folks would think him a might touched in the head. But they didn't know what he knew, what he thought he had seen and heard. The house and gardens had been completed and restored to their former beauty. All but the old brick walkway...Gerald remembered the words whispered on the wind. He had also kept the renovations true to the era of the house. Later that week he would plan a picnic dinner in the garden for Allison. He felt sure his mother would be there. She still loved her roses. Gerald had decided that informal was the best thing for dinner in the garden, so he set the table with some attractive floral plates, tumblers filled with sweet iced tea, and of course, a fresh bouquet of roses. The main course was a traditional Cajun jambalaya with homemade cornbread with creamy butter, and Beignets for dessert. Soon Allison arrived in her white BMW convertible. It was a beautiful day for a drive with the top down. 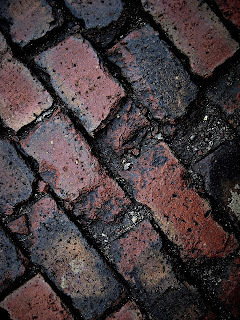 Her heels clicked as she walked along the brick walkway to the garden; her pale blue dress matched her blond hair and deep blue eyes and swayed gently as she approached. Gerald watched, his eyes twinkling at the sight of her. "Hi Gerry, I hope I'm not late." Her soft Southern accent was music to his ears. "Allison, you look lovely today, and of course you are right on time. Please, come have a seat." After enjoying the dinner and some quiet conversation, they strolled around the garden, and Gerald pointed out some of the different roses and where they came from. 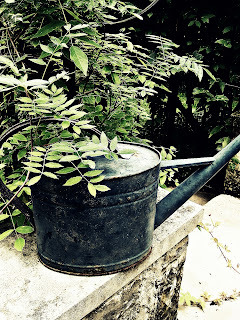 The garden had always been his Mother's passion, so that is where he began the restoration. They paused at the yellow rose bush, and he explained that his Father had given it to her the year before he died, and that it was her most prized bush. A sad smile briefly touched her lips. "Oh Gerry, that is so sweet. They obviously adored one another." As they returned to the table for dessert, there across Allison's plate was a single yellow rose. This magpie is building on last week's poem "Through the Door" and is a work of fiction. As my cousin Gerald and I were reminiscing about the past, Aunt Abigail came to mind. Gerald spoke lovingly of his mother, but with much sadness as he related his recent visit to his childhood home. I had known her well when I was younger, but like most of us, I grew up and drifted away. She was tall and thin with wispy white hair, and always wore an apron. For all her apparent frailty, she had the vim and vigor of someone nearly half her age. She worked in her garden every morning before the heat of the day, weeding her precious roses. Some of them were descendants of roses from the Royal Garden of Queen Elizabeth, which had been sent to her over 30 years ago. She had tenderly cared for them all those years. Her most prized bush was the yellow rose, called the Spirit of Freedom, that was presented to her by her husband (known to everyone as "the Duke"), the year before he died. Gerald had moved up north after graduation some years ago. Now with both his parents gone, he was the sole heir to the house and grounds, and had returned to dispose of the property. Her garden is hidden behind a high wall, and the gate has been locked since her death last year. He took the rusty key and slowly opened the lock, stiff from exposure to the elements. He opened the gate and stared into the garden. It was overgrown with vines, and small trees sprouting from nuts buried by squirrels. 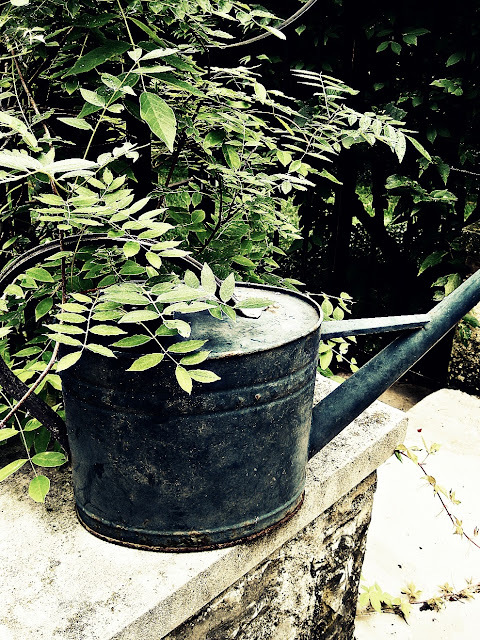 There upon the stone wall leading to the gardener's shed sat his mother's old watering can. It was half full of water just as if she were tending her precious roses, her solitary companions these last years. Gerald glanced around the garden and spotted his mother's yellow rose bush among the weeds. It had one beautiful yellow blossom that shone with beads of water, creating a miniature rainbow in each drop. As he turned, he saw a fleeting figure with wispy white hair and an apron freshly smudged with dirt.